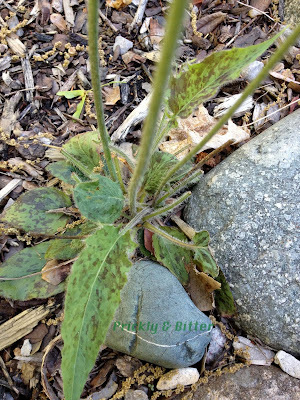 Prickly and Bitter: Sandra's Garden: This hawkweed has spots! I've been sitting on this blog post for a couple of days because I've been really unsure of the correct ID for this species. I was pretty sure I had it once...but then changed my mind. Then I was pretty sure I had ID'd it correctly again...but then changed my mind again! Now I've got it. I think. If you think I'm wrong, feel free to point it out in the comments section and lead me to a more appropriate name. This is one of the reasons why I hate trying to ID "dandelion-like flowers"--they're just so gosh darn hard to get the right name if you don't have a microscope and a full identification key handy! This species of hawkweed, incredibly common throughout Europe where it is native, is also now becoming more and more common in Canada. 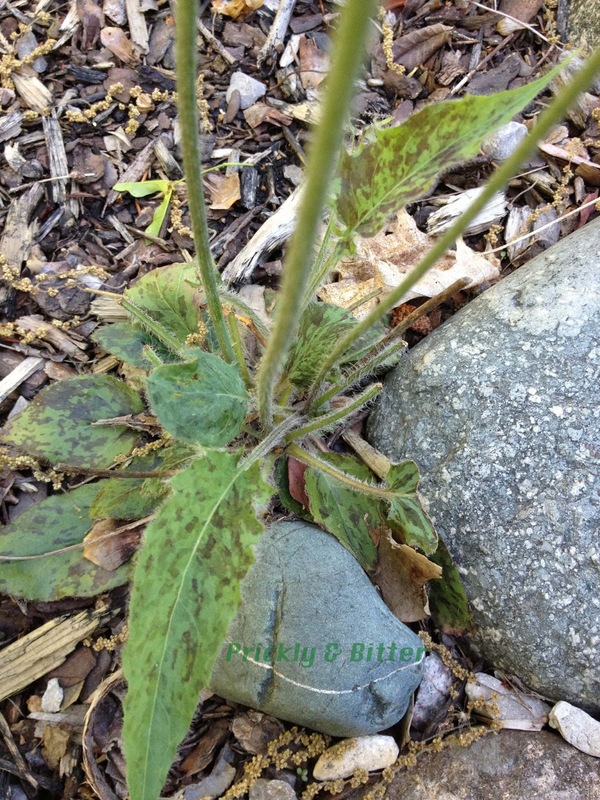 Here it's considered a weed since it thrives in highly disturbed areas which include that garden you just dug up to plant new flowers, or the area around where you just cut down the tree and don't know what to replace it with. 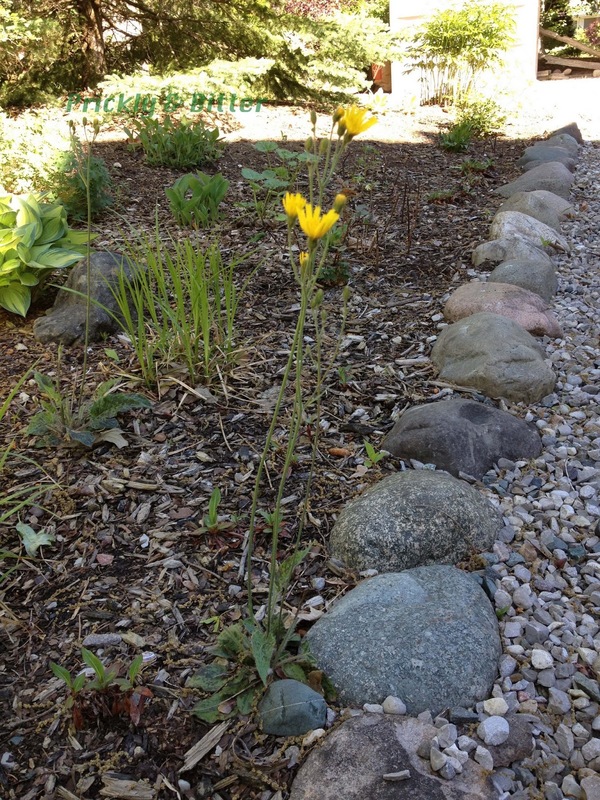 In Sandra's case it's growing right beside her driveway (made out of gravel, not asphalt), but it's also serving as a great example of what the definition of a "weed" is: a plant that's growing somewhere where we don't want it. Sandra's got a great philosophy towards gardening: "if I like the plant, then it gets to grow." While most of us would have ripped this plant out a long time ago because it looks far too much like a dandelion for our liking, Sandra lets it thrive behind a rock that serves as a buffer between the driveway and the mulched garden. Enjoy your time while it lasts, little plant! Hawkweeds are some of the most successful plants in disturbed areas because of the way they reproduce: they make asexual seeds. This phenomenon is incredibly unusual overall in the plant kingdom, and when a plant decides to reproduce asexually (which in itself is actually quite common) or clonally it rarely chooses to do so via seed production. Rhizomes, tillers, offsets or offshoots, suckers, foliar embryos, splitting, layering--all of these are common phenomena displayed in various plant species (sometimes even in groups as large as families) that rarely results in a seed-like structure being produced. In fact, plants that reproduce asexually prefer to do this over reproducing sexually but yet retain the ability to do so if growth conditions change. Reproducing asexually is much faster than producing seeds, and seed production is very energetically taxing on the plant (sometimes even killing the plant afterwards!). On top of that, you never quite know what kind of gene combination you're going to end up with since you shuffle all of your genes and they are randomly distributed (along with your mate's genes) into the seeds; each seed still gets one copy of each gene (or two, or four, depending on the plant...) from each parent, but each parent can have two different copies. Which one your offspring gets (you might have two good copies, one good and one bad copy, or two bad copies) is luck of the draw. Why would you risk giving your offspring a bad copy of a gene when you can just pass on all of your genetic material, exactly as it is, to your offspring so they can thrive like you do in the environment you're in? Seems like a no-brainer. But when the environmental conditions change and you are challenged as a plant in your environment, you might decide it would be best for you to roll the dice and take a chance at shuffling your genes so your offspring have a better chance in this new environment. Thus, seed production. But ASEXUAL SEEDS? 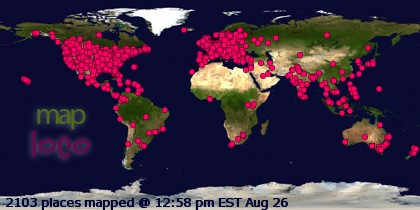 This just seems crazy. And for some plants, deciding whether to produce asexually or sexually is way too much work, and since your gene combination works for you it should also work perfectly well for your offspring, aka your clones. Almost the entire genus of Hieracium species reproduce exclusively via asexual seeds that are dispersed in the same way that dandelion seeds are in the wind; this process is called apomixis. This leads to the debate of "what is a species?" which is currently getting quite heated between experts that study this plant in Europe and in the United States. Some say that each clone should be considered a different species, since if you don't reproduce sexually it's impossible to tell who is your closest relative (a perfectly valid argument; one that has been raised in many other plant, animal and fungal species). That would give us about 10,000 species of Hieracium. Others argue that species should be defined based on broad morphological differences, which would give us about 800 species of Hieracium. Just a little difference! No matter which way you choose to define species, I think it's safe to say that there's a lot of them. If you tried counting to 800, it would take you a while; that's my definition of "a lot." 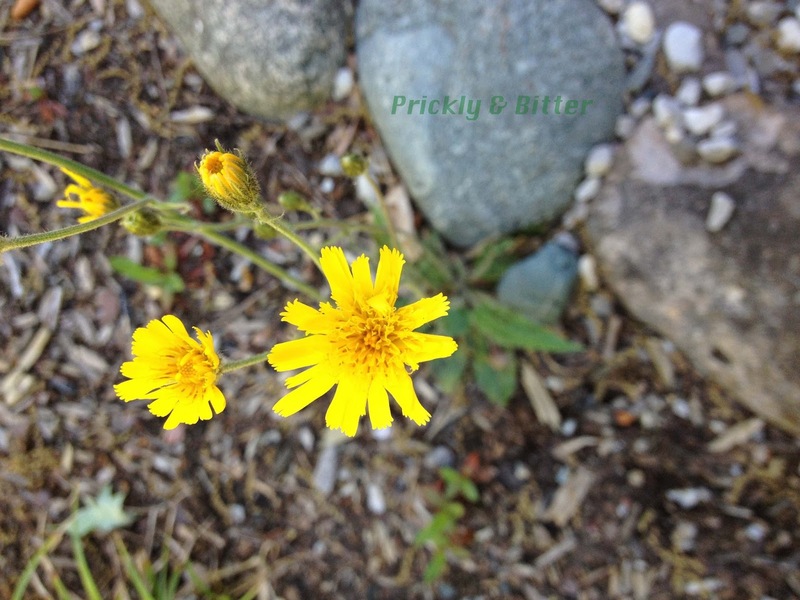 There are a lot of species of Hieracium. There. Problem solved! So what are hawkweed species good for? Absolutely nothing (sorry for just getting that song stuck in your head)! Actually, the plants themselves and the seeds are important food sources for a lot of animals, but one moth in particular: the large yellow underwing moth. This insect species is a great example of an insect that is expanding its range in response to warmer, shorter winters. Prior to the mid-1980s it was found exclusively in Europe and the Middle East, but after its introduction to Nova Scotia by accident in 1985 it has spread all the way to California and Alaska in 20 short years. Prior to that it had never been found further north than the southern edges of Russia! A pretty incredibly feat for a bug.